On the surface, it seems straightforward. Either you’re self-employed or employed. You either work as an independent contractor, or you do not. Well, when it comes to the classification of workers, things are not clear cut. And it leads to confusion. Some Nurse Practitioners think they work as independent contractors when they function as employees. Others work as independent contractors but don’t view themselves as being self-employed. And it gets even more complicated when someone with a fulltime job works a side hustle to bring home extra cash. 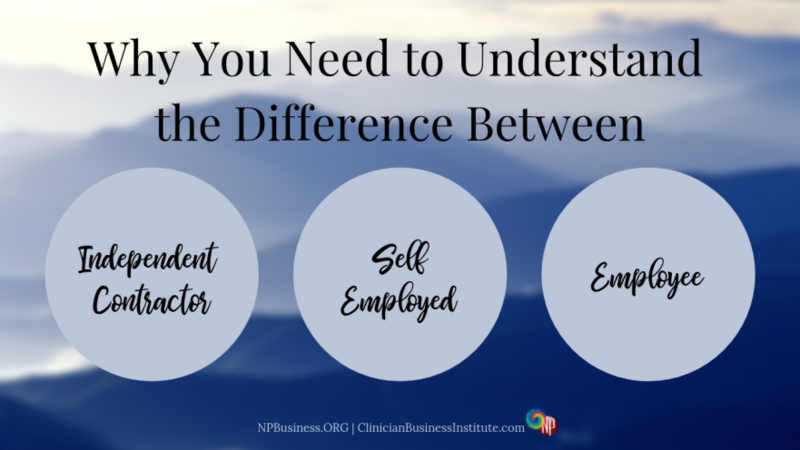 But no matter the situation, it’s critical you choose the correct classification; and it doesn’t matter if you’re the worker or the person hiring help. Because if you don’t, you could get yourself in a heap of trouble not only with the IRS, but also with local, state, and federal agencies. But before we jump in, let’s get one thing straight. If you work as an independent contractor (IC), you are self-employed; the two are one and the same. Independent contractors are known and go by different names. Some examples include freelancers, gig workers, contract workers, small business owner, creative professionals, to name a few. While all refer to a self-employed individual, they don’t indicate legal entity status, such as sole proprietor or LLC… that’s a different topic altogether. So now, let’s talk about what it means to be employed and what it means to work as an independent contractor or self-employed individual. When you’re self-employed, you’re required to pay self-employment (SE) taxes. Self-employment (SE) taxes are the independent contractor version of paying Social Security and Medicare taxes. SE taxes do not include income tax. Since there’s not an employer paying part of your Social Security and Medicare taxes, the percentages you must pay are slightly higher. It’s because you’ll be paying all of it. As a self-employed individual, you are required to file an annual return and make quarterly estimated SE payments. You’ll report your business income/loss on Schedule C, which attaches to IRS Form 1040, your personal income tax return. Of course, this particular scenario does may not apply to every independent contractor and may be different for you; filing requirement varies based on legal entity selection. When you’re employed, you’re also required to pay Social Security and Medicare taxes. While most employees know this, they aren’t always aware of it. That’s because all of it is done for them and happens in the background. The employer is required to withhold the appropriate payroll taxes, including social security, Medicare, federal income and unemployment taxes; the employer must also file reports and deposit the withholdings. And, there are additional state withholdings. But here’s the thing: regardless if an employee is full-time, part-time, or even seasonal, the withholding rules still apply. When a person is classified as an employee, the employer is required to withhold, file reports, and make payments on behalf of the employee. That’s what it comes down to… someone has to pay taxes. It’s either the employer or the independent contractor. The problem is, nobody is keen on paying taxes. Some even try to wiggle their way out of paying. Not too long ago, there’s been an extreme case. An employer changed the status of its workers from employees to independent contractors. Can you imagine the savings for the company and the headache for the employees? Since employees now were ICs, the company no longer had to withhold, match, or deposit on behalf of its workers. And benefits… paid to employees only. It’s no surprise the case lead to a lawsuit. Consequently, the IC laws were tightened in four states, including California, New Jersey, Massachusetts, and Illinois. If you live or work in any of these states, make sure you read our article about these recent changes. But now, let’s look at the rules and guidelines used by the IRS. What constitutes IC status and what does not? When evaluating IC or employee status, the IRS looks at the degree of control and independence exercised by the IC or employer across three categories. Who has control over how the worker completes work or what the worker does? The company or the worker? The more behavioral control a company has over the worker, the more the likeliness the worker is an employee. Who pays for expenses associated with the work performed? Is the worker reimbursed by the business or are expenses paid by the worker? How is the worker compensated: with a flat fee, one-time payment or through ongoing payments? Typically, employees are reimbursed for business expenses and receive ongoing payments, while IC’s do not. How do the business and the worker view their relationship? Are there written IC agreements in place? What is the length of the working relationship? Most employees are brought on for the long term, whereas the IC relationship often has a limited time horizon. As you can see from the partial list above, the IRS looks at many factors to determine whether a worker qualifies for IC status or not. It’s important to note that every case is unique. While it seems two similar situations would yield the same result, each must be examined on its own merit. Even though similar, one situation may qualify for IC status while the other may not. Also, the IRS provides a variety of information, which you can find here. Additionally, you may consider getting professional help if you find yourself struggling with determining the proper classification. Misclassifying workers may not only result in costly fines and penalties but cause major headaches too. Here are some of the things that may happen when someone is misclassified as an independent contractor when it should be an employee. Back payments to state and federal agencies, such as unemployment insurance and workers’ comp. Potential penalties from various state and federal agencies. Potential criminal action if misclassification is found to be intentional. If you are a business and decide to work with an IC, you only pay the agreed upon rate for services to be rendered. There are no further obligations on your part; you are not required to withhold or pay taxes on payments to the IC. The only other thing you must do is issue Form 1099 to the IC end of the year. On it, you report to the IRS how much you paid to the IC. However, if you hire an employee, you are required to withhold not only income taxes, but you must also withhold and pay Social Security and Medicare taxes. Additionally, you must pay unemployment tax on any wages paid to the employee. At the same token, if you work as an independent contractor, you must report and pay all required federal and state taxes as discussed above. Don’t allow yourself to be misclassified by someone. We’ve heard about NPs contracted as ICs, when in reality they function as employees. Have you run into any issues with ICs? What’s your experience been when it comes to independent contracting? Why not share it with us, so all of us can learn from it! I am considering moving to Georgia do you know if I can bring my independent practice with me? Currently in Arizona where NP’s are independent. Hi Felicia, Whenever you move states, it’s critical there you become familiar with the laws in which the state you are in and make sure you are within the scope of practice for that state. Furthermore, if you are going to practice across states lines, you need to have licenses in the states where your patients are and need to adhere to those scope of practices as well. Florida being a red state is going to require collaboration, which you don’t need in AZ. If you work with insurance, you’ll also find changes there as well. In the case of an employed NP leaving a private primary care practice, who bears the onus of mitigating patient abandonment issues? The practice or the NP? If the employed NP leaves one practice and immediately begins working in the same capacity for a different employer in the same community, does this impact the NP’s risk of patient abandonment? In all the years I’ve been working, I’ve never heard of an NP being held for responsible for patient abandonment when he/she leaves employment (assuming the usual notices) and starts a new position. That said, I’m not a lawyer and I don’t know the circumstances behind this question. If there is a concern, you’d be wise to consult with your attorney/malpractice. The company (in whatever structure) would contract with the NPs to provide services. You do not have “payroll”. With ICs you do not pay taxes or benefits of any kind. You’ll pay them the contracted fee. At the end of the year, there are several options to generate 1099s for each of the contracted NPs.